Othello - Anton Wingen Jr. BRAND: Moore Maker PATTERN: #5101 UDP OAL: 8” BLADE LENGTH: 3-3/4” GUARD: Brass HANDLE: Smooth White Bone TANG STAMPS: 5101 UDP/2014 ..
MAKER: Case PATTERN: #06263, Eisenhower penknife LENGTH (Closed): 3-1/8” BOLSTERS: Nickel silver SHIELD: Oval Case shield HANDLES: ..
MAKER: Case CUSTOMIZED BY: Orvet Customs (Dale Vincent) PATTERN: #32095; Fish knife CLOSED LENGTH: 5” BOLSTERS: Nickel silver HANDLES: Yellow .. BRAND & MAKER: Schrade-Walden PATTERN: 165OT Woodsman BLADE ETCH: ORVET CUSTOMS (logo)/ DALE VINCENT OAL: 9-1/2” BLADE LENGTH: 5” GUARD: .. BRAND: Rigid PATTERN: Dagger/boot knife OAL: 9” BLADE LENGTH: 5” GUARD: Brass and integral part of handle HANDLE: ..
MAKER: Western CUSTOMIZED BY: Orvet Customs (Dale Vincent) PATTERN: W66 hunting knife OAL: 8-5/8” BLADE LENGTH: 4-3/8” GUARD: Aluminum HANDLES:.. 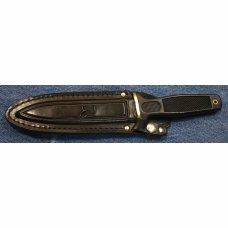 BRAND: Ulster Knife Co. RESTORED BY: Orvet Customs (Dale Vincent) PATTERN: Penknife CLOSED LENGTH: 3-1/4” HANDLES: Stag (from the Henckels fact.. BRAND: Boker MAKER: Boker U.S.A. PATTERN: Scout/Camper LENGTH (Closed): 3-3/4” BOLSTERS: Steel SHIELD: None HANDLES: Black jigged c..
MAKER: Schrade Cut Co CUSTOMIZED BY: Orvet Customs (Dale Vincent) PATTERN: Grafting & Budding Knife CLOSED LENGTH: 4” HANDLES: Smooth black bone.. 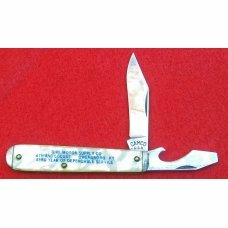 BRAND: Aug. Muller PATTERN: Step bolster Congress LENGTH (Closed): 3-3/4” BOLSTERS: Nickel silver step bolsters HANDLES: Red jigged bone BL.. 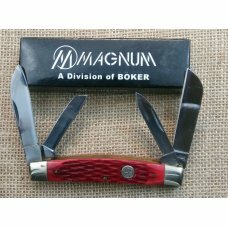 BRAND: Boker Magnum Bonsai PATTERN: Congress LENGTH (Closed): 4-1/8” BOLSTERS: Nickel silver SHIELD: Boker Bonsai shield HANDLES: Red .. BRAND: Boker Magnum Bonsai PATTERN: Sowbelly Stockman LENGTH (Closed): 4-1/8” BOLSTERS: Nickel silver SHIELD: Boker Bonsai shield HANDLE.. BRAND: Boker Magnum Bonsai PATTERN: Canoe LENGTH (Closed): 3-5/8” BOLSTERS: Nickel silver SHIELD: Boker Bonsai shield HANDLES: Red jigged..
MAKER: Buck PATTERN: Bucklite #422 LENGTH (Closed): 4-1/8” HANDLES: Black plastic BLADES: Single locking clip blade TANG STAMPS: BUCK/422^/..
MAKER: Western PATTERN: #S-751 Fish knife LENGTH (Closed): 4-3/8” BOLSTERS: Nickel silver SHIELD: Shield is a fish look sharpening stone. H..
MAKER: Utica PATTERN: Featherweight Girl Scout LENGTH (Closed): 3-3/8” BOLSTERS: Aluminum SHIELD: Girl Scout shield HANDLES: Roger’s Bon..
MAKER: Gerber PATTERN: LST 400 LENGTH (Closed): HANDLES: Orange Zytel BLADE: Drop point TANG STAMPS: GERBER Pile Side: Portland..
MAKER: George Wostenholm CUSTOMIZED BY: Orvet Customs (Dale Vincent) PATTERN: Barlow CLOSED LENGTH: 3-3/8” BOLSTERS: Steel HANDLES: Sambar stag ..
MAKER: Kershaw PATTERN: Whiskey Gap #4100 CUSTOMIZED BY: Orvet Customs (Dale Vincent) BOLSTER ETCH: DALE R. VINCENT/SALEM, OR LENGTH (Clos..
MAKER: -Imperial Schrade Corp. PATTERN: -Muskrat – 77OT LENGTH (closed): -3-78” BOLSTERS: -Nickel silver HANDLES: -Saw cut Delrin BLADES: -2 carbon ..
MAKER: Anton Wingen Jr. PATTERN: Senator (4 blade) LENGTH (Closed): 3” BOLSTERS: Nickel silver SHIELD: None HANDLES: Jigged bo..
MAKER: Imperial PATTERN: 3 blade utility LENGTH (Closed): 3-3/4” BOLSTERS: Steel HANDLES: Roger’s Bone BLADES: Spear blade, ca..
MAKER: Imperial Knife Associated Companies PATTERN: 153UH Golden Spike OAL: 9-1/4” BLADE: Saber ground clip point blade of carbon stee..
MAKER: Columbia River Knife and Tool (CRKT) PATTERN: #5173 Klecker Nirk Novo LENGTH (Closed): 3-3/4” HANDLES: Stainless Steel BLADE:..
MAKER: Imperial Schrade Corporation PATTERN: 153UH Deerslayer OAL: 10-1/2” GUARD: Integral guard with upper thumb ramp HANDLE: Saw..
MAKER: Schrade PATTERN: Avatar AV-7 LENGTH (Closed): 4” HANDLES: Aluminum with TPR (thermoplastics BLADES: Single have serrated cl..
MAKER: Camillus Cutlery Company PATTERN: Cap Lifter Jack – (a.k.a. beer jack) LENGTH (Closed): 3” BOLSTERS: Nickel silver bolsters H..
MAKER: Imperial Schrade Corp. PATTERN: 55OTG Bruin LENGTH (Closed): 3-3/4” BOLSTERS: Brass SHIELD: Brass Old Timer shield HANDLES: Green s..
MAKER: Imperial Schrade Corp. PATTERN: #808 Serpentine Pattern LENGTH (Closed): 2-3/4” BOLSTERS: Nickel silver SHIELD: Nickel silve..
MAKER: Schrade PATTERN: 61OT Slim Premium Stock LENGTH (closed): 4” BOLSTERS: Nickel silver SHIELD: Old Timer oval HANDLES: Saw cut Delri..
MAKER: Imperial Knife Associated Companies PATTERN: #4435 LENGTH (Closed): 4” BOLSTERS: Brass SHIELD: None HANDLES: Hardwood ..
MAKER: Imperial PATTERN: #4514 Sportsman Lockback LENGTH (Closed): 4” BOLSTERS: Nickel silver SHIELD: Powderhorn Frontier Shi..
MAKER: Gerber Legendary Blades PATTERN: Silver Knight LENGTH (Closed): 3-1/4” BOLSTERS: Stainless steel HANDLES: Wood BLADES: ..
MAKER: Ulster PATTERN: Peanut #183S LENGTH (Closed): 2-7/8” BOLSTERS: Nickel silver HANDLES: Stagged black composite BLADES: Hal..
MAKER: Ulster PATTERN: #81P jack LENGTH (Closed): 2-9/16” BOLSTERS: Nickel silver SHIELD: Nickel silver oval HANDLES: Celluloi..
MAKER: Al Mar Knives PATTERN: Utility Series Trapper LENGTH (Closed): 4-1/8” BOLSTERS: Stainless Steel HANDLES: Wood BLADES: Drop..
MAKER: Schrade PATTERN: CH8S LENGTH (Closed): HANDLES: Dupont Zytel BLADES: Partially serrated clip blade BLADE ETCH: Joe Beaver..
MAKER: Gerber BRAND: Gerber PATTERN: D.M.F. 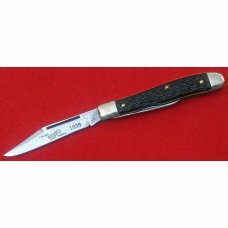 Manual – Dual Multi Functional HANDLES: Black G-10 LENGTH (Closed): 4.8” LENGTH (ope..